Monday, May 25th at 11:00 a.m. Afterward, we will conduct a similar flag ceremony at the Hut, followed by a reception with refreshments. The Auxiliary will be participating, and included in our plans. The Hut Ceremony and Reception will be RESERVED for families/members. 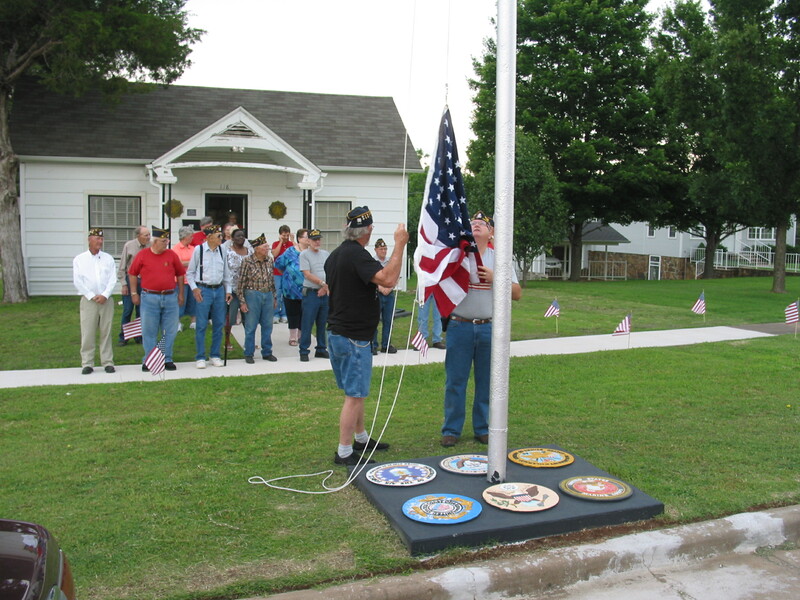 Babo Carter is organizing volunteers to place flags, prior to the Memorial Day weekend. More details and times to be announced. We successfully placed flags on Main Street, and Highway 99 and Highway 20. We will be out at the Powell Cemetery to place small stick flags on all of the graves. Babo will have maps of the veterans’ graves, located at the cemetery. We will need ‘all hands on deck’, for this event; and we are looking for community groups to help out. We will be taking down and collecting all flags, following the Memorial Day Weekend. For more information, contact: Charles O’Leary, 918-697-9130.